Decorate patio area is not easy. Commonly, people put some green plants of flowers to decorate their patio. It's so great and fun to take care plants and flowers there. But it will be nice if you put some interesting accessories furniture there. Get some idea to make you patio looks different and interesting. Here are we give you an example of patio decoration. 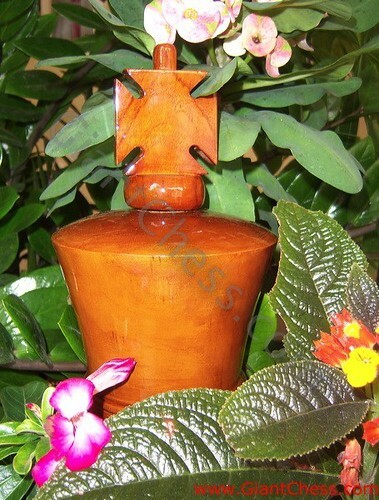 Here we have a giant chess piece that polished in brown or natural wood color. By its giant size and a carving product, this King chess piece can become your unique patio decoration. Put it at your outdoor area. It is durable product for outdoor use, so you do not need worry about its damage because we have prepare for this risk.